Thank you for the opportunity to speak on expanding the bike paths on the George Washington Bridge. This month I’ve had opportunity to review your Special Oversight Committee hearings, as well the writings of its members. Permit some observations that I will put into context. In early 20th century, the Authority was formed to coordinate the region’s rail and water freight. Stymied by rail operators, you would instead create facilities to usher in the automotive age, and by mid-century, aviation. Fast forward to early 21st century. Irene. Sandy. Public transport decimated. Gas lines for miles. $70 billion to repair and replace damaged property. The 5th UN Panel on Climate Change and US National Climate Assessment. Add the Authority’s own exposure to sea level rise and extreme weather event. 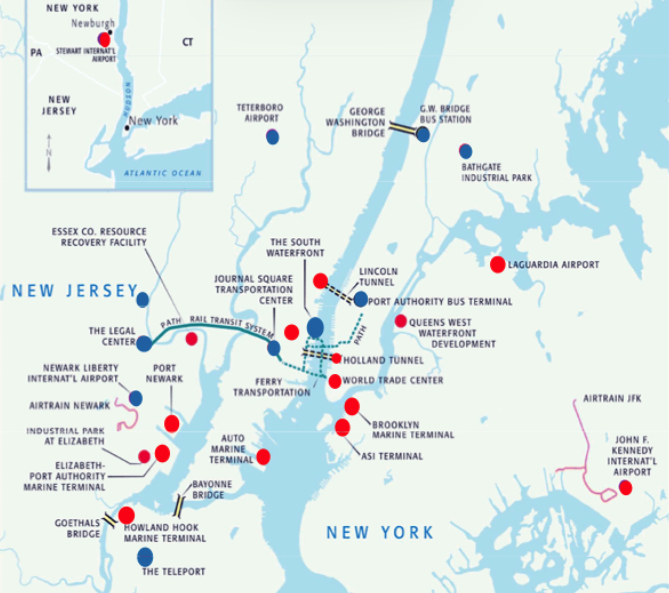 Map of Port District facilities. Image PANYNJ. Suffice your second century won’t be a rerun of the first. So, looking out, what might your priorities be? I submit that a regional plan stressing “sustainability” would garner broad, bi-state support from the Governors on down. Considering you subsidize low emission vehicles up to $7.50 per trip, expanding the GWB bike paths represents a high profile, yet incredibly inexpensive opportunity to exhibit leadership on sustainability. It’s no accident that, in the Netherlands 1/3 of all trips are on bicycle. That was decades of sustained planning and implementation following the 1973 Arab oil embargo. But it’s also no coincidence the Netherlands is the European nation most at risk to sea level rise. So, I ask you regard the your centennial and the restringing of the GWB as milestones upon which to implement regional change and influence national policy. You have motive, means, opportunity … and responsibility to strike while the iron is hot. (1) The PA estimates $90M to cantilever out a paths along the main spans.